Building on the success of it's bigger brother, the Mini Dekker produces a vibrant light show with 48 coloured beams from it's 2 ultra bright 10W RGBW LED's. The Ameircan Mini Dekker is easy to use with 7 different operation modes including strobe effect. With the ADJ Mini Dekker you get an easy 4 button Menu to select the internal programmes and select DMX-512 operation. The American DJ Mini Dekker has a handy bracket to easily fit to any DJ setup and with the Mini Dekkers lightweight design makes it easy to install. 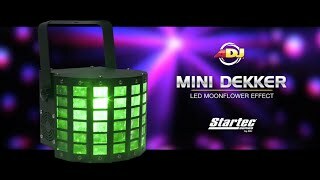 Considering purchasing the American DJ Mini Dekker? Have questions? Ask people who've recently bought one. 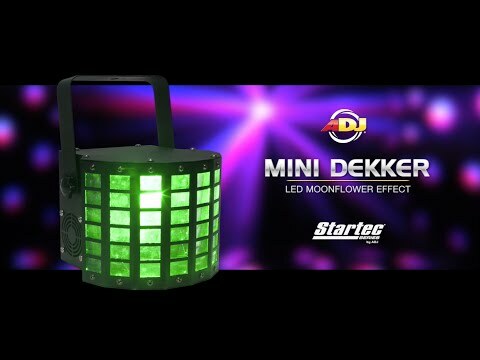 Do you own the American DJ Mini Dekker? Why not write a review based on your experience with it. A simple and effective way to cover a dance floor with lighting, two of these small fixtures will cover a small to medium dance floor with no issues. With almost 180 degrees of cover wall-to-wall won't be an issue either and at this price point this little fixture is great value for money. Particularly useful where space and / or mounting options are limited. Given the price it's no surprise that the options on this unit are limited with only one show available in "SHOW" mode the ability to turn sound activation on or off. Sound sensitivity is adjusted by use of a rotary control on the rear of the unit which I have to say I prefer to a digital sensitivity adjustment. Undoubtedly to get the most out of this fixture you would need to use DMX control where individual colours and movement etc can be controlled but don't let that put you off these great little lights. The colours (RGBW) are bright and vibrant and look great with a bit of haze or smoke. All in all for the price I cannot fault the Mini-Dekker, you get plenty of bang for your buck. Gets 5 stars from me. Recommended. Used this with the chavet kinta FX,more than upto the task for my house party!! Good construction seems robust. Doesn't have iec out to daisy chain into other lighting effects. Not that bright, but I have it set up amongst some quite powerful lights. But for the price it's not a bad lighting effect, good spread of beams, DMX control. Didn't expect much when I ordered these but they are really bright for their size and price! I'm a newbie when it comes to lighting. This does the job for me fine. I'd have liked more customisation over colours and patterns available from the built in menus, but I get that it's meant for use with a DMX controller. Without one it can be set to move in reaction to sound, which is good enough for my small rig. It provides a wide dispersion and is well bright enough for a small crowd. This is a good light for starting it and but a bit loud but if you have music playing you shouldn't hear it. Brought for a small living room, works well.. Smoke machine is needed to bring the best out of it.. Lights bright but not blaring.. Can't wait to test light to its limit in dmx mode.. Best price on the market..
Great product - provides a great effect. Can be a little loud but once the music is on this doesn't prove a problem at all. These may be mini versions of the original Dekker but these guys punch above their weight. I purchased these in the DJKit showroom and had the opportunity to see them up against the Mini Kinta and they are definitely brighter. They run the typical ADJ four-button LED menu system which is pretty straightforward to navigate but I'm using them with the WiFly NE1 DMX controller (via cable or WiFly Battery - these Mini Dekkers do not have WiFly built-in). The NE1 opens up full individual colour, speed, strobe and dimmer control of these rather than just having them run sound-active all the time. At this pricepoint they're excellent value for money, easy to use and set up and produce a widespread moonflower effect on the dancefloor. If you're on a budget, pick up an Accu-Case F4 bag to keep them safe and you won't go far wrong. Seen a video for American DJ Mini Dekker online or have you own video? Check out American DJ Mini Dekker on DJkit.com!